October 24th, 2017Another Retailer Slip Up – Watch that Intellectual Property! As the nights start to get colder and the calendar turns to October many are excited to see stores fill their shelves with costumes and candy. However, this year as Halloween approaches struggling retailers Kmart and Sears are experiencing another fright. Already dealing with dropping sales and shuttering stores nationwide, in part thanks to monsters such as Amazon and other online stores, an untimely lawsuit by a past business partner doesn’t help their cause. Silvertop Associates Inc. has filed a complaint against Kmart and Sears alleging copyright infringement, trade dress infringement, and unfair competition. 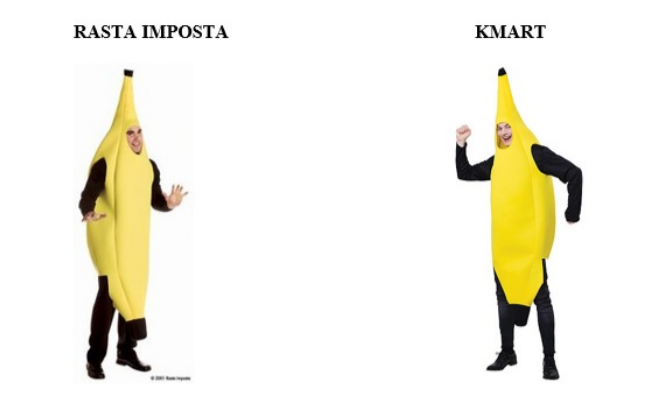 Kmart and Sears have purchased “Banana Costumes” (shown below) from Silvertop since 2008. The bright yellow, full body costumes, with the customer’s face filling a hole in the main section of the fruit, as arms and legs poke through the peel, have recently been a very popular choice all around the country. However, after nearly ten years of doing business together, this season an agreement couldn’t be reached. Not wanting to leave eager trick-or-treaters disappointed Kmart and Sears found a replacement supplier to fulfill the orders. It seems as if the replacement was too good. The new supplier’s product is allegedly too similar to the copyrighted design. Silvertop received a Copyright Registration for the Banana Costume design in 2010 (No. VA 1-707-439). The design accentuates yellow color with dark tips at the ends, lines running down the sides, specific placement of the cutout holes, and using models who wear long black pants, a shirt with black sleeves, and black dress shoes. It’s interesting to note that this is the first time that Silvertop is bringing suit for infringement of this design, when others have surely been seen and sold in stores across the US. It’s possible that the intimate familiarity with the alleged infringer might be playing a role, a factor typically favorable to the copyright holder. In similar suits, those accused of infringement found it hard to use ignorance and lack of knowledge as a defense when the two parties to a suit had done business together. With thousands of these costumes sold across the country every year as part of a 3.4 billion dollar costume industry, this lawsuit is going to be an interesting one to watch. If Kmart and Sears are forced to stop sales, cancel shipments, pull product from shelves and pay willful infringement damages the end of the fiscal year might be even scarier for the already struggling retailers than previously anticipated. It can’t be stressed enough the importance of involving Intellectual Property as part of business decisions for companies of any size. Whether companies are just starting out or they are already players on a global stage their decisions can have monumental impacts on their bottom line. For the sake of brevity the copyrighted design (left) and the replacement suit (right) are shown below for your own judgement as to the likely outcome of the case.